More than 500 students received degrees at the 2016 Brandon University Spring Convocation at the Healthy Living Centre. BRANDON, Man. 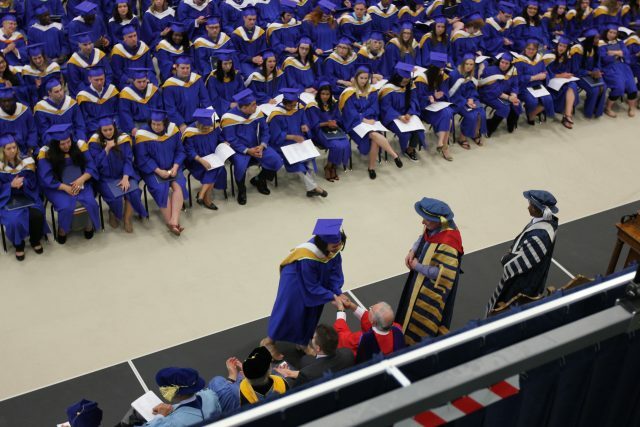 – Today is an occasion to celebrate for Brandon University’s (BU) newest graduates. A total of 536 degrees were awarded at the 2016 Spring Convocation in two ceremonies at BU’s Healthy Living Centre. The graduates of the Faculties of Arts, Health Studies and Science were recognized during the morning ceremony. In the afternoon, degrees from the Faculty of Education, the School of Music and the Integrated Bachelor of Arts/Bachelor of Education program were presented. 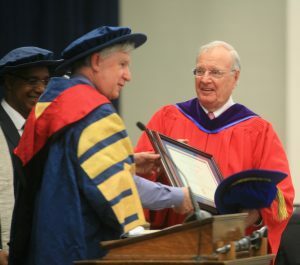 The Right Honourable Paul Martin, right, receives an honorary degree from Brandon University President Gervan Fearon and Chancellor Michael Decter. Valedictorian Roque Lacroix, who received a four-year Bachelor of Science with a major in Computer Science, spoke to graduates during the morning convocation ceremony. Jocelyn Bruce, a Music Education graduate, specializing in Senior Years Instrumental Music, was the valedictorian in the afternoon. 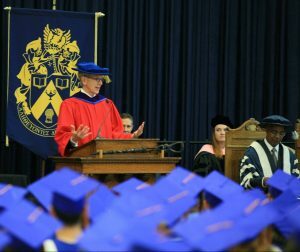 Eric Friesen speaks to graduands after receiving an honorary degree at the 2016 Brandon University Spring Convocation. “I congratulate each of our outstanding graduates on this very special day,” said President and Vice-Chancellor, Dr. Gervan Fearon. “Throughout our history, Brandon University has helped shape leaders and capable individuals who support the betterment of communities. These deserving graduates are our leaders of tomorrow, and I am excited to see the great things they will accomplish in the future. Honourary doctorates were bestowed on The Right Honourable Paul Martin and Eric Friesen. Mr. Martin was honoured at the morning ceremony for his contributions to Indigenous Education as well as his service to Canada, nationally and internationally, as the 21st Prime Minister. Mr. Friesen, a long-time broadcast host and executive, was honoured during the afternoon ceremony for his contributions in promoting the performing arts to Canadians as well as culture and media at a global level. At the morning ceremony, Dr. Louis Visentin was formally presented with the designation of President Emeritus in recognition of his leadership and dedication during his tenure as President and Vice-Chancellor from 2000 to 2009. The celebration continues tomorrow at the HLC with the fifth annual Brandon University All Nations Pow Wow, honouring Indigenous students graduating in 2016. The Pow Wow will have Grand Entrances at 1 and 7 p.m.